I'm going back to basics for awhile to revamp some things about my painting process. I've noticed some bad habits creeping into my paintings, and I'm really excited about correcting them and moving forward to make more of an artistic statement in my work. In order to accomplish these goals, I've dedicated this Stillman & Birn 9x12" wirebound sketchbook to the process, though I might do some of them on other supports too. This paper holds up really well to anything I throw at it, so here goes! 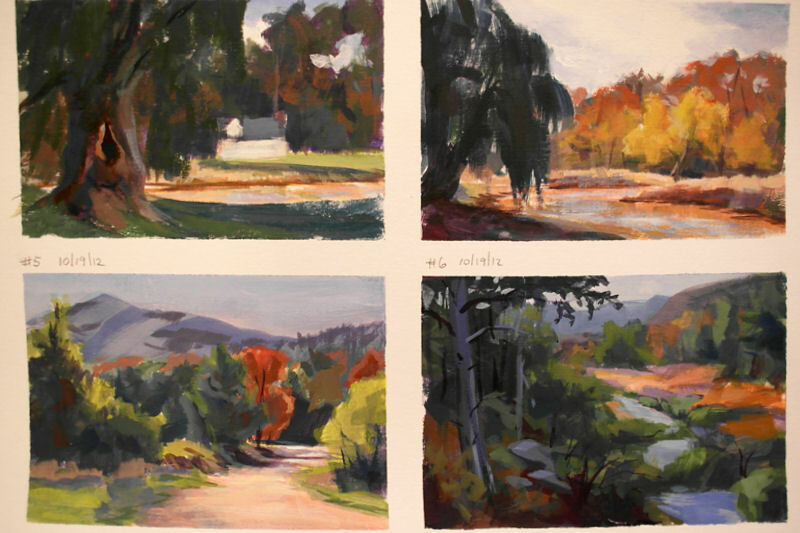 I'm planning to do at least one of these studies a day --- sometimes a full page, and sometimes just a portion of a page --- in addition to my regular paintings. Yesterday, I taped up a couple of pages into quarters so that I could do more of them faster. I'll do some of them in monochrome, but most in color. I may test drive different palettes too. The emphasis will be on design, and experimenting with how value, color, and composition work together in creating a painting that impacts the viewer. These four studies were done with acrylics, using just Naphthol Crimson, Cadmium Yellow Light, Ultramarine Blue, Titanium White, and Carbon Black. I reverted to a red-yellow-blue simple palette in the interest of keeping my color clean and simplifying the process. (I usually do not use any Naphthol reds, but it's what I happened to have on hand, and whadaya know..... It worked!) I'm using acrylics because it dries quickly, doesn't lift, is opaque, and can be painted on paper. I'll probably do some of them in gouache and other water based mediums too, depending on what is convenient at the time. In contrast to much of my work over the past few years, which builds on transparent layers, I am planning to work more directly with opaque paint on these. I'll work from life when I can, but I'll also work from photos. The two on the top of this page were done yesterday at the Eleanor Roosevelt National Historic Site in Hyde Park, New York. The bottom two were painted today from photos. The study on the bottom left was done from a photo taken during my recent Adirondack trip. The lower right is from a photo taken at my property in the Catskills. I started out this series working the full 9x12 pages, but after the first two, I saw problems which would be more quickly resolved by working smaller and faster, and then bumping the size back up again once I've worked through the issues that I'm seeing. I'll do at least a few more quartered pages before I go larger again with these.